Jay was born on a reservation in Canada to a Mohawk Chief. He was a star Lacrosse player and a boxer before he entered films as a stuntman in 1938. He worked in a number of films through the forties before he gained some notice as the Osceola Brother in Bogart's film 'Key Largo (1948)'. Most of his roles consisted of bit parts as "Indian". In 1949, Jay would work in a movie called 'The Cowboy and the Indians (1949)' with another 'B' actor named Clayton Moore. It was later that same year that Jay would he hired to play the faithful Indian companion, Tonto, in the Television Series "The Lone Ranger". This role, while still playing the "Indian", would bring Jay fame that his motion picture career never would. 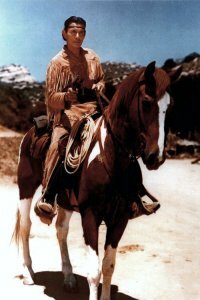 As Tonto, on his horse Scout, Jay could go show up where the Ranger could not and some of the time he would be shot at or beat up for his trouble. Jay would play Tonto in all the episodes except for those that he missed when he had his heart attack. In those episodes, he was replaced by the Ranger's nephew, Dan. But Clayton would miss the third season when he was replaced by Actor John Hart. Together with Clayton, Jay would reprise the role of Tonto to "The Lone Ranger" in two big screen color movies, 'The Lone Ranger (1955)' and 'The Lone Ranger and the Lost City of Gold (1958)'. After the series ended in 1957, Jay could not escape the typecasting of Tonto. He would continue to appear in an occasional film and television show, but he would become a spokesman to improve the portrayal of Indians on TV. 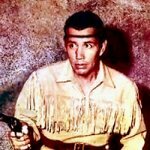 Jay Silverheels passed away on March 5, 1980 at the Motion Picture Country Home and Hospital in Calabassas, Ca. He was just 60 years young. But in that short time, he left a legacy of pride, integrity, decency, and respect. He helped shape the moral values of so many lives, while also giving his time to help those that could not always help themselves. He certainly gave more than He ever received. May His memory carry over to future generations.